Kali Audio only launched at the start of 2018 but it already has big ambitions, a great naming philosophy and a debut monitor that seems, on the face of it, to be incredible value for money. The Southern Californian’s first release is the LP-6, the ‘LP’ standing for ‘Lone Pine’ (which is actually a small town in the Eastern Sierra that is the first port of call for climbers wishing to scale Mt. Whitney, the highest mountain in the United States outside of Alaska, fact fans). The thinking is that it’s the start of their journey, just as LP-6 is the start of Kali Audio’s journey. It’s just a shame the company’s not located in ‘the Blue Ridge Mountains of Virginia,’ but what the heck, I love them already! Despite the price tag, Kali Audio has set out to design the LP-6 with complete accuracy in mind, as any monitor company should, of course. You need to hear every detail when you are mixing, after all, and any colouration in the EQ will have you adjusting to compensate, giving your resulting mix an incorrect boost or cut in that area. So Kali claims there is no such colouration, ‘Nothing is boosted or suppressed to cover flaws or try to sound more pleasing’. 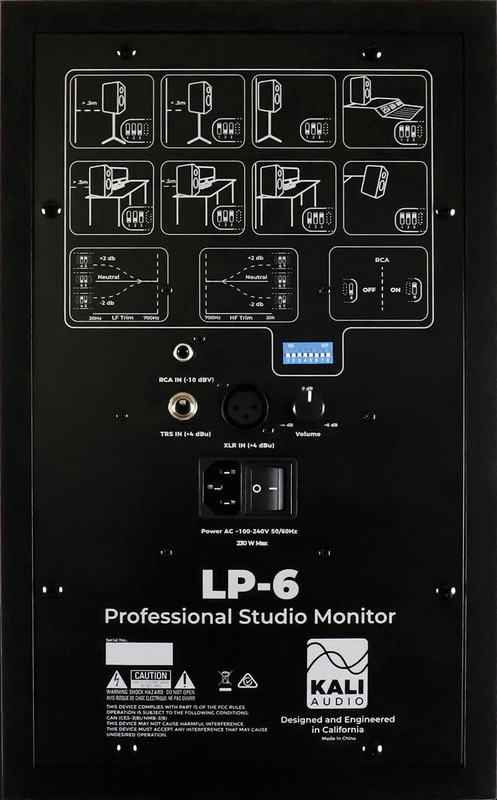 The LP-6s have been designed for small to mid-sized studio monitoring. They should deliver enough clout for those scenarios as they boast 85dB of continuous output at 2 meters, with 20dB of headroom to handle any louder peaks. Other design features include a front port for a tighter bass response and low noise ‘chuffing’ which can occur because of air turbulence on poorly-designed speaker ports. The woofer has a large voice coil and magnet designed to deliver both clarity and an extended bass response. There’s a dual layer, 1.5” voice coil which promises to cut down distortion and a 3D Imaging Waveguide in which the tweeter sits which Kali says will deliver a ‘wider, taller and deeper image’. Its shape has been designed to ‘match the interactions of the HF and LF drivers’ so the listener hears the reflected sound in congruence with the direct sound, although the quality of the results will obviously depend on placement and the room. Around the back you get both XLR and TRS jack inputs and, usefully, an RCA input which can be set to -10dBu for laptop and smartphone input. This is done with one of eight dip switches located above the inputs, the remainder of which allow adjustment to boundary EQ settings and high and low frequency trim. Kali Audio has included these, recognising that where you put a speaker can significantly alter its EQ response. It has therefore included diagrams – see left – located above the dip switches to show you which settings to make according to eight typical in-use situations including wall-mount, desktop and speaker stand. My tests with the LP-6 involved placing them on stands and then desktop, and then running some of my (trusted) mixes of my own music through them. These are tracks that I’ve either recently been working on quite intensely, so know them in forensic detail, or mixes of music that have been around for years that I know warts and all. (They might not be great, but I know their frailties!) Then I have a group of classic tracks by various artists, again that I know in intimate detail. At least part of the test is comparing the LP-6s to my own monitors, the two-way PMC Result6s. Yes, I know that is unfair to compare a set of 300-quid speakers to monitors that cost a couple of grand more but what impresses me with the PMCs is their flat response, something the LP-6s are attempting to emulate, so this method should reveal how the Lone Pines stand up in that regard. Settings wise I used the aforementioned dip switch settings for a monitor on a speaker stand less than half a meter from the wall and left everything else alone… initially anyway. The excellent news is that the response across the frequency range does seem to be largely accurate. The bass is tamed and tight for the most part and not coloured. I did notice a slight flab on some heavier tracks but I’d have to say that, overall, it’s about the most controlled low-end that I’ve heard in any speaker at this price point. I also didn’t get much in the way of port chuffing so the promises of that design have been born out. The overall frequency response feels very flat to me to and all of the detail is there. The image is wide, not the widest I’ve heard, but there is space there, always great when you want to place instruments and tracks accurately. Vocal reproduction is excellent, male vocals particularly. Here, when compared directly to the PMCs I could only tell the two apart because of a little extra magic dust from the PMCs. However, the LP-6s did struggle a little as you reach further upwards. High frequency response was slightly lacking for instruments in the cymbal territory as were the crunchy, higher parts of electric guitar. It was all there but not quite as present, and once I moved away from male vocals to female, I’m pretty sure I would have pushed the top end while mixing. Well, maybe not if I’d remembered the dip switches! A quick nudge of the HF trim (dip numbers 6 and 7) made quite a dramatic difference in my tests, bringing a lot more presence to the upper mid and high frequencies. 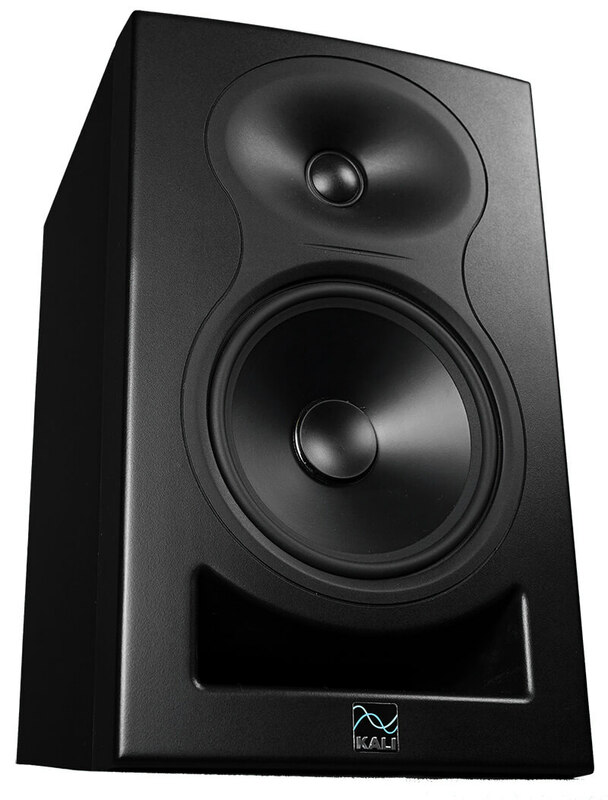 It wasn’t quite as broad as my reference monitors, but at a fraction of the cost, these are great performers. You need to hear your mixes in as accurate a form as possible so make sure you consider this. If a speaker has colouration in the bass, for example – perhaps designed to make it sound more musical – then you will hear extra bass as you mix, and pull it down to compensate. Then, when you play back that mix on another system, it will sound thin and bottom-less as you mixed the bass out. 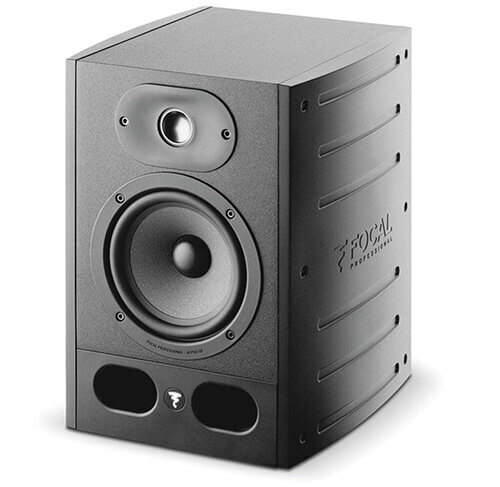 The ideal monitor has a flat frequency response across the board. The trouble is this usually costs, as does a great image, but the LP-6s are the best that I’ve heard for both regards at this price. So while we’re always saying ‘spend as much as you can on a set of monitors’, if you simply don’t have the funds, then these really are a great buy. The LP-6s deliver a sound that punches well above their price point. If you were to blind test them against speakers a lot higher in price tag, I’m pretty sure you’d be surprised as how well they stand up. Similarly, if you were to do the same against monitors at their price point, I think they’d stand head and shoulders above them. accordingly. 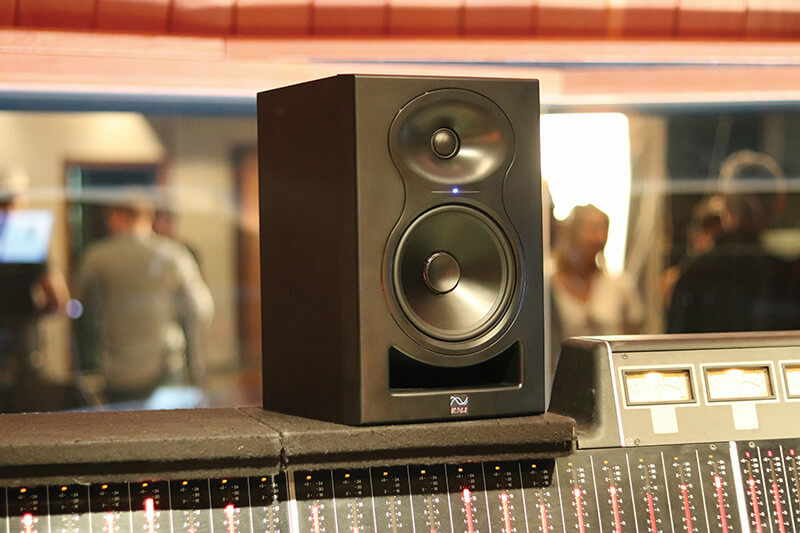 With many monitors – especially at the lower end of the market – you simply don’t get a lot to play with in terms of that adjustment, but with the LP-6s you get a lot, and it really can make a difference. Kali Audio’s opening salvo in the speaker market is a great one. 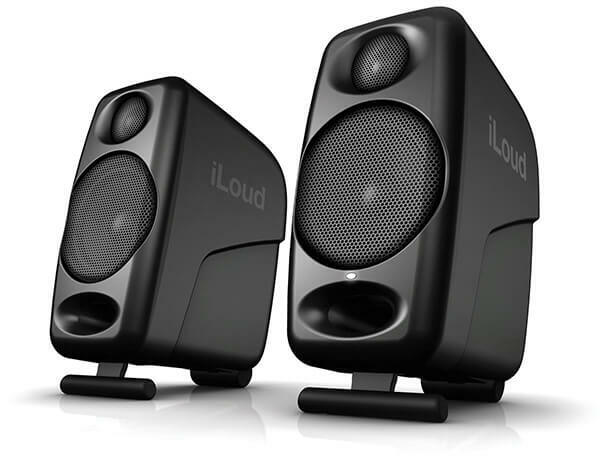 The company set out to design an accurate speaker at a very low price and they have gone and done it with the LP-6s. They really are some of the best monitors you can get at this price and can easily out punch models twice their price or more. 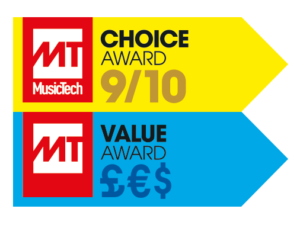 It’s been a while since we reviewed monitors at this price point so we’re going to have to go right back to the Focal Alpha range which won our Monitor of the Year award and still remains a fantastic buy if funds are lacking. You can’t really compare these in terms of size as the Micros are desktop monitors but price wise, these were our previous favourite ‘cheapest’ monitors and really do a great job considering how much they cost and how small they are.